"Francis Xavier Seelos was born in Fussen, Germany, in 1819. Expressing his desire for the priesthood since an early age, he entered the diocesan seminary of Augsburg after completing his studies in philosophy. Upon learning of the charism and missionary activity of the Congregation of the Most Holy Redeemer, he decided to join and go to North America. He arrived in the United States on April 20, 1843, entered the Redemptorist novitiate and completed his theological studies, being ordained a priest on December 22, 1844. 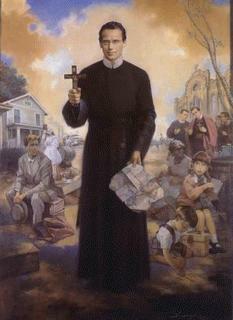 He began his pastoral ministry in Pittsburgh, Pennsylvania, where he remained nine years, working closely as assistant pastor of his confrere St. John Neumann, while at the same time serving as Master of Novices and dedicating himself to mission preaching. In 1854, he returned to Baltimore, later being transferred to Cumberland and then Annapolis, where he served in parochial ministry and in the formation of the Redemptorist seminarians. He was considered an expert confessor, a watchful and prudent spiritual director and a pastor always joyfully available and attentive to the needs of the poor and the abandoned. In 1860, he was a candidate for the office of Bishop of Pittsburgh. Having been excused from this responsibility by Pope Pius IX, from 1863 until 1866 he became a full-time itinerant missionary preacher. He preached in English and German in the states of Connecticut, Illinois, Michigan, Missouri, New Jersey, New York, Ohio, Pennsylvania, Rhode Island, and Wisconsin. He was named pastor of the Church of St. Mary of the Assumption in New Orleans, Louisiana, where he died of the yellow fever epidemic caring for the sick and the poor of New Orleans on October 4, 1867, at the age of 48 years and nine months. The enduring renown for his holiness which the Servant of God enjoyed occasioned his Cause for Canonization to be introduced in 1900 with the initiation of the Processo Informativo . On January 27, Your Holiness declared him Venerable, de creeing the heroism of his virtues"
While St. Mary’s Church in New Orleans was damaged from Hurricane Katrina, the relics of Blessed Francis Xavier Seelos, CSSR, were not, said Father Henry McKeever, CSSR. "The chief relics were removed in time to save them from any damage. They will be returned as soon as things clear up down there," said Father McKeever, area contact for the National Shrine of Blessed Seelos, based at St. Mary’s Church in New Orleans. St. Mary’s is the national headquarters for the canonization cause of Father Seelos. St. Louis, Father McKeever noted, has its own shrine "branch" where devotions to the priest are commended at St. Mary of Victories Chapel, 744 S. Third St. in Downtown St. Louis. Pray for the people of New Orleans!